Sorry I wasn’t able to get back and blog sooner……… every time I went past the computer place in San Mike it was closed or all stations were full. Down there, all the places lock up for siesta at 2, until 4 pm. That’s hard to get used to. I got 10 paintings (or studies ) done while I was there. But about a thousand fotos to work from. As you may detect, I’m talking in the past tense. We came back Thursday, from a cold (by their standards) and rainy Mexico, to a whiteout blizzard in Rochester. To tell you the truth, I didn’t go San Miguel to be cold, I can do that just fine right here, so I cut my losses and came home to sit in front of the pot belly and paint. It really is a freindly place down there, though. Loads of happy US expats, siting around and ignoring the crap that Bush and his buddies got us into back stateside. Pleased to be out of it and no wish to return. The art and cultural scene there is very active and everyone is up to date on whats going on. Oh Man, we went to a sanctuary where the Monarch butterflys migrate to each year. It’s in the mountains, about 11,000 feet high, in a forest of 75 foot tall pine trees. 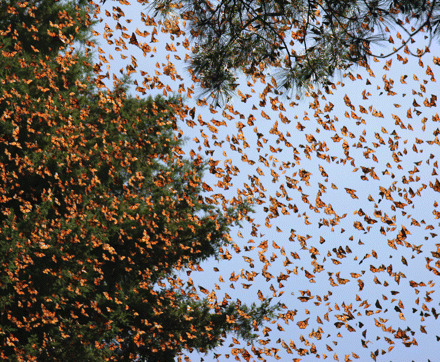 As you look up, the trees look like they are filled with HUGE hanging bees nests….. but not so, they are clusters of Monarchs piled on top of each other, some branches break from the weight of the clusters. When the sun comes out and warms them up, they start to fly arround in clouds of orange and black, sounding like it just started to rain. Everyone , native Mexicans and tourists alike stand there, transfixed by the vision of it all…….no one speaks out loud, ever ! It feels like you are in a church, or better yet, a concert hall just seconds after the music has stopped, and you don’t want to come back to this mundane existence too soon for fear that you may loose touch with the mystic thing that is happening around you.. They come down and land all over everyone like snow flakes. Okay, now go and try to paint that one. And strangely enough, no less than ten minutes over the hill, a village was washed away in a mud slide two days ago. That seems to sum up Mexico in my mind, such tranquil beauty and tragedy living side by side at every turn.